It is STILL summer in this fine city. Natives claim this isn't really possible, and yet it is still warm, even by continental European standards. (Yes: Weather is a huge issue here, and forever a great source of small talk material.) So after a day in the office, it is a good idea to make some use of it and go for a walk. 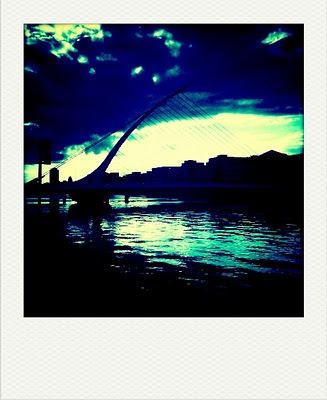 This stroll took me along the Liffey to Dublin's newest bridge - looks like a harp, but is named, mysteriously, after Samuel Beckett. In other news, we started an a cappella group at the office! Amazingly, it has more guys than girls so far (but mostly tenors). Fame is surely right around the corner. That is extraordinary - about the a capella group, I mean. More men than women, and them mostly tenors? So one of the most unusual voice types predominates? That is so bizarre. Is it something in the water, do you think? Now I'm just trying not to worry about the fact that the second meeting was already cancelled.